By taking steps to prepare your home for the upcoming winter weather in Illinois, you can reduce your home’s carbon footprint AND save money on energy bills at the same time. For years, savy homeowners have prepared for the winter by caulking their windows, filling in holes in the exterior walls, and insulating the attic. These inexpensive steps can help save a lot of money on utility bills, and they just happen to help reduce the home’s impact on global warming. According to author David Bach’s Go Green, Live Rich, homes in the U.S. account for more than 20% of the country’s energy demand and 20% of the carbon dioxide emissions. Much of that comes from electricty usage from appliances, heating, and air conditioning. Install a programmable thermostat if you haven’t already. When you are away all day, there is little reason to keep the thermostat set at the same temperature that you do when you are at home. Set the thermostat lower during those hours and raise it up when you return. It can cost anywhere from $25 to $100, but will easily pay for itself by the spring. 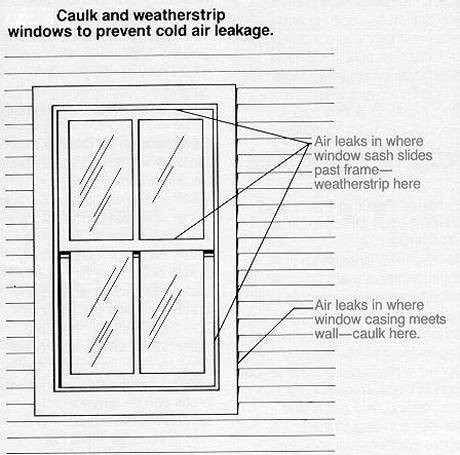 Caulk your exterior windows. Every few years, it is wise to remove the old, cracked caulk around your windows and re-caulk to tighten up the air seal. If your windows need replaced and you are on a budget, consider buying plastic to help seal the interior windows. You can buy a kit at your local hardware store that contains the plastic and tape to seal around the window frame. Use a hair dryer to make the seal. If you have a fireplace that you do not use, have it closed up to prevent the hot air from escaping up the chimney! Electrical outlets along outer walls of the home typically do not contain any insulation. For a few dollars, you can purchase a pack of foam insulators that sit directly behind the cover plate of outlets and wall switches. Your attic may be losing you money through openings around exhaust fans, ceiling fans, pipes or electrical wiring. Use caulk or expanding foam to seal them up. The air ducts that move heat from your furnace through the house may be leaking as well. Considering hiring a professional to have them tested. Hiring a professional to tune up your furnace for the winter is a great idea, but for those on a tight budget, replacing dirty filters and sealing air ducts can save as much as 10% on your heating bills! If there are rooms in your house that you do not use, then why pay to have them heated with the rest of the house? By closing the vent and sealing the door, you can avoid paying to heat unused space. During the day, open the curtains and allow the sun to warm the house. Be sure to close them at night to help insulate the room from cold creeping through the windows. Be sure that furniture and curtains are not blocking the air flow from registers. According to the book Save Energy, Save Money published by The Family Handyman magazine, increasing the humidity with the thermostat set at 68 degrees can make a home feel 5 to 8 degrees warmer. If you have a humidifier, but it to good use. If you have a deciduous tree that shades your home in the summer, the same tree will help keep the home warmer once the leaves drop off in the fall and the sun shines through the windows. Tip: if you have an extra thermometer handy, consider moving it around the house to see where you have cold spots that need to be addressed. Here are some other tips to consider that are not directly tied to global warming: shut off valves of outdoor faucets, leave a layer of leaves in flower beds to help protect the soil from the harsh weather, consult your owners manual on how to winterize your lawn mower, and clean up the gutters to prevent blockage. While there are other steps you can take to help make your home more energy efficient – like radiant floor heating and insulating your walls – starting with the simple steps will keep your home warmer and your wallet fuller.